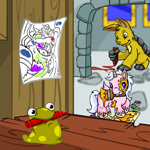 Kadoaties; they are one of Neopia’s favorite Petpets. They stole our hearts when they were introduced to the Neopian public the 29th day during the Month of Hunting in 2001. Since then we have been able to play with our loving little creatures, keep them fed while their owner is away, or collecting memorabilia to keep around our Neohomes just for keepsakes. As we know, Kadoatie’s are not the cheapest Petpets to own, but with such a cute little face you can’t say no. If you can’t afford one of these lovely Petpets, there are other ways you can show your love for them. Over the years TNT has released many items that any Kadoatie fan could want, but there are seven essential items that every Kadoatie lover NEEDS. P> The cute Pink Kadoatie Backpack is essential for anyone who enjoys these little cats. Whether you are using this backpack for school, travelling around Neopia, or just something casual, this backpack will always come in handy! It is large enough to hold everything you could possibly need no matter where your adventures lead you. This cute and stylish backpack is sold in the Neopian School Supplies shop. It has a rarity of 86, so you won’t see it stock too often. Don’t worry, you should always be able to find them on the Shop Wizard for around 3,000 NP. Who would NOT want to dress up like a Kadoatie? I would be lying if I said I didn’t think of it maybe once…or twice… Of course, before a Kadoatie is painted into whatever color your Neopet desires, they are blue. With this hoodie you can channel your inner Kadoatie! This super stylish and versatile hoodie can be worn anywhere with anything! (Although I would not wear it to Terror Mountain…brrr) We suggest you wear this around Neopia wearing some super comfortable slacks along with some closed toed shoes this autumn. This hoodie debuted in the NeoCash Mall* game “Jubjub Power Bounce” back in 2011, however, the only way you can obtain this article of clothing now is with trading with another player. With this stylish and PINK bicycle, you can easily sport around town with your backpack and hoodie showing off to strangers and your Neofriends! I guarantee that all will be very jealous! With this bicycle there is a little basket on the front which allows you to hold and store some of your (Kadoatie) things in case your backpack is stuffed full of goodies! This bicycle is available through the NeoCash mall! You receive the bike when you purchase the “Pink Bruce Key Quest Token” for the price of 250NC. After you activate your token, you will find your new bicycle in your inventory! What more could you possibly need besides this super loveable Kadoatie?! Its favorite spot to be is atop of your shoulder. This little one will go everywhere with you! They love adventures and they love being outside with you! While you are running errands, you Kad can sit on your shoulder, but if that makes you nervous, you can always set it into the basket of your bike. Safety first! This little fellow stocks at the Neopian Gift Shop. It has a rarity of 85, so you won’t see it stock much just like the beloved backpack. Don’t fret! This loving companion can be bought on the Shop Wizard for around 30,000NP. A loveable plushie for such a loveable little Petpet. Most of us dread the fall of Valentine's Day, but with this little plushie, there will be nothing but love in your heart that day. This plushie features a big heart surrounded by two little hearts. How could you not look at this and feel all warm and fuzzy inside?! It is the perfect companion for you to take to school with you or just around town. It does fit nice and snug in your Pink Kadoatie Backpack or in the basket of your Pink Kadoatie Bicycle! If your loving Kadoatie is in the bikes basket, they can keep one another company. The plushie stocks at the Plushie Palace in Neopia. With a rarity of 88, you won’t see it stock too often. You would think this plushie in particular would have a decent price tag attached to it, however you can find one on the Shop Wizard for around 15,000NP! Kad lovers rejoice! Your favorite Petpet comes in a bite-sized cookie! These super cute and fun snacks are perfect whether you are home, out and about, or baking for Neofriends! Yes, these cookies are too cute to eat, but how could you let these go rotten?! Might as well put them to good use! These fan-favorites are sold in the Neopian Fresh Foods shop. They have a rarity of 95, so they don’t stock in the shop too often. Don’t fret! You should be able to find these biscuits on the trading post, but at a hefty price around 1,500,000 NP on the Trading Post. Who says you can’t have your cake and eat it too? If you were daunted by the costly price tag of a regular Kadoatie, you can always opt to a cute, Birthday Kadoatie! With this Petpet, you can make it seem like it is your birthday every day! Delectable pink frosting with sprinkles on top? Yes, please! Yes, they do look cute enough to eat, but that is frowned upon in in Neopia. These Kadoaties made their debut in the 14th Birthday Goodie Bag. Since they are only available in the goodie bags, they are a rarity 101 and can’t be bought in any of the shops in Neopia. You can find one for sale on the Trading Post for around 250,000 NP. 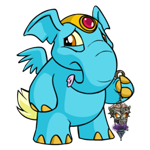 While there are many cute Kadoatie items throughout Neopia, some items are just essential to collectors and lovers of the Petpet. This whole collection can be yours for under 2,000,000 NP with the exclusion of the NeoCash items. These items are just personal favorites of mine. Keep an eye out for new Kadoatie items for your collection. Hope you enjoyed it and happy shopping! *NeoCash Mall items cost real money. You must have parental permission or be 18 or over to make a purchase.